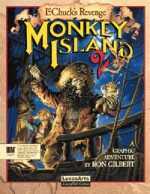 This is a sequel to Secret of Monkey Island. Guybrush Threepwood is back again, and this time around is searching for the mysterious treasure called (drum roll, please) Big Whoop. Already having defeated LeChuck and becoming a pirate, he assumes it'll be smooth sailing on his new voyage. He only has a few things standing in his way--namely he's stuck on a strange island run by pirates, has no boat, no map to the treasure, and recently lost all of his material possessions to LeChuck's former right-hand man, Largo LaGrande. Not to mention the fact that Largo has stopped all pirates from setting sail. The evil ghost pirate LeChuck hasn't left the stage also. His subordinates are trying to bring him back from the dead one more time. Guybrush must also win back Elaine's love as their relationship hasn't gone well. The game utilizes the same command-based SCUMM interface and branching dialogue system that were used in its predecessor. The game features hand-painted graphics, many new locations, and plenty of challenging puzzles to solve.MI2 is considered by many fans and critics to be among the best of LucasArts' adventure games. Despite its popularity, its ambiguous and surrealistic ending drew criticism. It was also the first adventure game that in the beginning offered 2 levels of puzzle difficulty. The easy level had some puzzles and minor plot elements trimmed. In 2010, a special edition was released featuring high-definition graphics, a re-mastered musical score, full voiceover, and an in-depth hint system.